Leeds United’s disappointing season ended on a cheerier note as they comfortably beat QPR 2-0 in front of a big crowd at Elland Road. Well taken goals from Kemar Roofe and Kalvin Phillips clinched one of the easiest wins of the campaign with Leeds ending in 13th place in the Sky Bet Championship. It had the air of a final game of the season as neither side had much to play for, but once the Whites went ahead they never looked in danger of defeat. Rangers started well enough with Josh Scowen hitting a 25-yard shot over and Matt Smith heading over under pressure from Pontus Jansson. It took United 26 minutes to have their first effort on goal and they came close to a goal as Pontus Jansson flicked on a low corner only to see his goalbound effort hit team-mate Caleb Ekuban on the line. A mighty scramble followed and Phillips powered in a shot that was well blocked off the shoulder of a visiting defender. Another corner did bring the opening goal when Phillips headed the ball on and Roofe came up with a spectacular overhead volley to smash the ball into the roof of the net. It was the cue for Leeds to take charge with Roofe’s 20-yard shot taking a deflection to become an easy save for keeper Joe Lumley. Tom Pearce then got forward well from left-back and saw his shot beaten away by Lumley The ball was then played back in by Pearce, but Ezgjan Alioski’s glancing header sent the ball just wide. QPR had a chance right at the end of the half only for Darnell Furlong to send a header over from a free-kick. United made a flying start to the second half as Rangers were pressured into a mistake at the back and Phillips seized his chance to fire home from the edge of the box. Luke Freeman went close after a good run at the other end, but there were few further scares for the Whites, who could have added to their lead. Roofe sent a bending shot just over following a fine pass by back to form Ronaldo Vieira and Alioski should have scored when meeting Roofe’s clever low cross at the back post, but with only the keeper to beat he hit the ball straight at him. 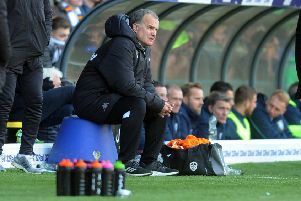 Leeds were comfortable enough for Heckingbottom to put on promising 16-year-old striker Ryan Edmondson up front and the teenager almost scored within three minutes as he met Alioski’s pull back only to see his shot deflected wide. Vieira’s long range blockbuster was blocked by a defender and late on Alioski sent a free-kick over as the game ended 2-0. Head coach Paul Heckingbottom was pleased to end the campaign with a victory. He said: “It was a nice way to end the season. It might not have been the season we wanted, but it was nice we ended with a win. “It was a good performance and a clean sheet. It was important that the players could thanks the fans for their support. “They were two good goals from our point of view, which we’ve worked on in training. “We decided to change the shape and have three forwards pressing and they did it great. On the future, he added: “The club came and got me so they know what I want to try to do and that’s what I’m aiming to get to with the way I want the team to play. “We need a better balance in the squad. There’s talent in there and good technicians, but we need to get the balance right to be equipped for every game. Leeds: Peacock-Farrell, Ayling, Jansson (Pennington 45), Cooper, Pearce, Forshaw (O’Kane 87), Vieira, Alioski, Phillips, Roofe (Edmondson 73), Ekuban. QPR: Lumley, Cousins, Furlong, Bidwell, Manning, Scowen, Chair (Osayi-Samuel 60), Wszolek (Smyth 62), Freeman, Eze (Oteh), Smith.